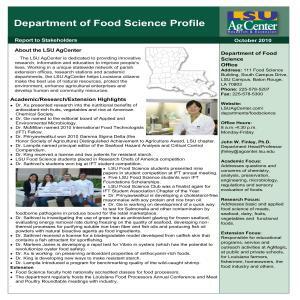 Click here for the PDF version of the Department of Food Science Profile. You can access a PDF version of the Department of Food Science Profile below. Addresses questions and concerns of chemistry, analysis, preservation, engineering, microbiology, regulations and sensory evaluation of foods. Addresses basic and applied food science of meats, seafood, dairy, fruits, vegetables and functional foods. Responsible for educational programs, service and outreach activities at AgMagic, at public and private schools, for Louisiana farmers, fishermen, homeowners, the food industry and others. Dr. Xu presented research into the nutritional benefits of antioxidant-rich fruits, vegetables and rice at American Chemical Society. Dr. Ge named to the editorial board of Applied and Environmental Microbiology. Dr. McMillan named 2010 International Food Technologists (IFT) Fellow. Dr. Prinyawiwatkul won 2010 Gamma Sigma Delta (the Honor Society of Agriculture) Distinguished Achievement to Agriculture Award, LSU chapter. Dr. Lampila named principal editor of the Seafood Hazard Analysis and Critical Control Compendium. Dr. King received a license and two patents for resistant starch. LSU Food Science students placed in Research Chefs of America competition. Dr. Sathivel’s students won big at IFT student competition. LSU Food Science students presented nine papers in student competition at IFT annual meeting. Five LSU Food Science students won IFT Foundations Scholarships. LSU Food Science Club was a finalist again for IFT Student Association Chapter of the Year. Dr. Prinyawiwatkul is developing a cholesterol-free mayonnaise with soy protein and rice bran oil. Dr. Ge is working on development of a quick way to test for Salmonella and other contamination by foodborne pathogens in produce bound for the retail marketplace. Dr. Sathivel is investigating the use of green tea as antioxidant glazing for frozen seafood, evaluating energy removal rate during freezing on the quality of seafood, developing non-thermal processes for purifying soluble rice bran fiber and fish oils and producing fish oil powders with natural bioactive agents as food ingredients. Dr. Sathivel received a license for a biodegradable model developed from catfish skin that contains a fish attractant for sportfishing. Dr. Marlene Janes is developing a rapid test for Vibrio in oysters (which has the potential to revolutionize oyster food safety). Dr. Xu is working on preserving antioxidant properties of anthocyanin-rich foods. Dr. King is developing new ways to make resistant starch. Dr. Lampila introduced a program for benchmarking quality of the wild-caught shrimp. Food Science faculty hold nationally accredited classes for food processors. The department regularly hosts the Louisiana Food Processors Annual Conference and Meat and Poultry Roundtable meetings with industry. Food science research focuses on such activities as developing new food uses for Louisiana agricultural products including functional foods and pioneering food safety procedures for meat, poultry and seafood; evaluating the effectiveness of various food production practices and assisting processors by conducting safety- and quality-related analyses of food products. Outreach efforts are primarily targeted to the state’s food producers and processors, including seafood, meat, poultry, dairy, rice, sugarcane, fruits and vegetables. Faculty work closely with the food industry to assist them in meeting regulatory requirements for food safety and in improving various aspects of food quality to assure only the finest Louisiana food products reach the market. Food Science is a relatively small but vibrant department with 32 undergraduate students, 29 master’s students,16 doctoral students and 12 tenured faculty. The department was established in 1962 by four members of the Agricultural Chemistry & Biochemistry Department. Students are trained and prepared for careers in the thriving Louisiana food industry. Research is conducted to advance knowledge in food safety, packaging, toxicology, technology, sensory evaluation, compositional analysis, engineering and food-based human health issues through fundamental and applied approaches. Increase undergraduate and graduate student enrollment and student participation in national professional programs. Add a program in acidified food targeted at the growing industry of acid foods such as hot pepper sauces, marinades and jellies. Expand current seafood research and institute new programs for evaluation of food quality in response to recent Gulf oil spill. Develop new research programs in functional foods, food-based preventative health care and nutritionally enhanced foods. Enhance research of bioactive food compounds, including functional foods, antioxidants and cardiovascular-inflammation reducers. Develop research to fight obesity with low-calorie lipids and resistant starches. Increase utilization of agricultural and aquacultural by-products. Expand research in food packaging and food coatings. Introduce program for benchmarking quality of the wild-caught shrimp — onboard sodium reduction, value-added shrimp products and rapid methods to detect abuse of humectants.